Following the global financial crisis deep cuts to welfare budgets have become a default policy response for policymakers around the world. Andrew’s book explores the history of the welfare state, assesses the debates around the survival of welfare states that have intensified since the crisis, and considers new funding solutions and new ideas such as universal basic income. 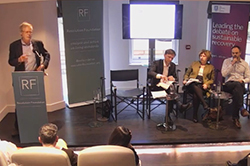 Karen Buck MP (MP for Westminster North and member of the Work and Penions Select Committee) and Anthony Painter (Director of Policy and Strategy at the RSA) responded to Andrew’s book to give their take on the future of the welfare state and debated whether a universal basic income solution could be viable and affordable. 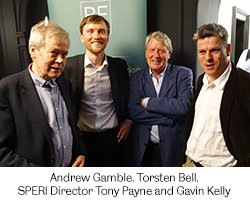 Andrew’s opening speech was introduced by Gavin Kelly, Chief Executive of the Resolution Trust and the event and the audience Q&A on universal basic income was chaired by Torsten Bell, Director of the Resolution Foundation. You can watch the whole debate online. 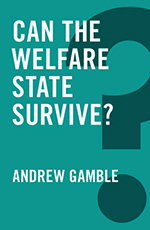 The arrival of a new book by a serious social democratic theorist – Andrew Gamble’s Can the Welfare State Survive? – is a heartening sign of the left waking up to the challenge. Instead of incrementally contesting every fresh cut, the need is to go back to first principles. So rather than concede to more aggressive means-testing or conditionality based on “good behaviour”, Gamble springs out of the defensive crouch and embraces the idea of a citizen’s stipend paid universally as of right. And remarkably, in this era of Benefits Street, the idea of a basic income is finding fans across the spectrum. Andrew’s book can be purchased from Polity here.